The one trend we can't get enough of: minimalist utility hook racks. We’ve tackled nearly every sort and style of shelving available for kitchens; open, closed, built-in, mixed-and-matched… you get the point. Needless to say, we can’t help but embrace the latest emerging trend in kitchen storage: minimally-clad utility hook racks. Here’s everything you need to know to recreate the look at home. Practical, useful, and beautiful objects. That’s the focus of Zealand-based home shop Father Rabbit. Their masterfully-curated selection of home essentials entail cleverly crafted pieces, with minimalism in mind. Naturally, it should come as no surprise that we’re taking a page out of their book on how to assemble a effortlessly chic yet curated utility shelf. When it comes to selecting a shelf or set of wall hooks, opt for a frill-free design that errs towards the utilitarian. Create a subtly accented detail by opting for a piece that boasts a shade with a soft contrast. Here, a delicate-blue gray complements both the whitewashed walls as well as the slew of maple wood accessories. Now, there’s a spot for those random odds and ends—aprons and oven mitts, we’re looking at you. This one’s all about working double duty. The items that deck the hooks are just as important as what stands beneath them. 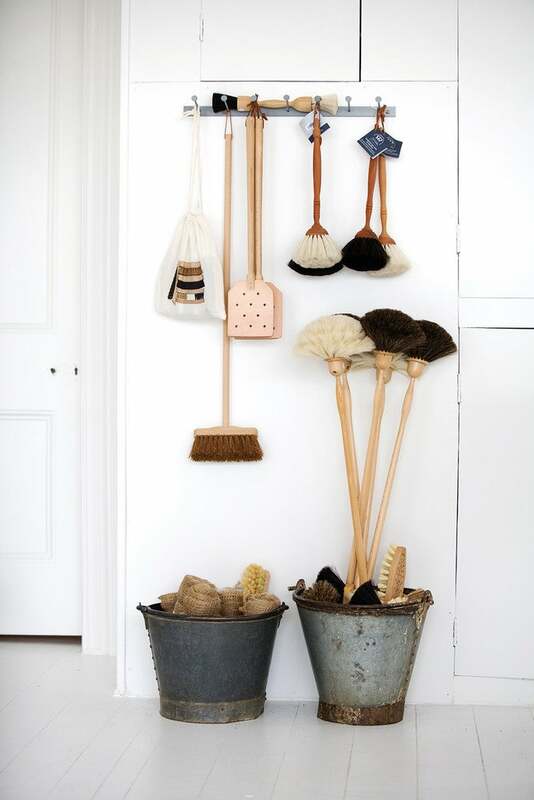 Set a pair of baskets or bins (or, opt for a set of galvanized buckets) to hold the more unsightly of your cleaning essentials. From dust pans and brooms to market totes and even posies of fresh herbs, think of these utility hooks as an opportunity to impart a commonly overlooked area of the home, with major style. Filter in tied eucalyptus bundles for a fragrant element that’ll go a long way. Whether it incentivizes you to invest in more style-focused market totes, or to simply show off the collection you’ve already garnered, we love the idea of utilizing the shelf to house market totes. Bring together a diverse set of bags to impart the area with a textural layer. Tour the rest of this home on Jenni Kayne’s blog Rip and Tan. Empty corners and nooks can be easily transformed into fully-functional storage solutions, without seeming too cluttered—even if the floor space beneath is already being utilized. Install a pair of lengthy hook bars adjacent to one another, to create an extended shelving unit. Bonus points for the fact that it will allow you to evenly space out the materials you hang on. See more of this dreamy, Canadian home here! For those who require additional storage space, aside from the hooks, opt for a lengthy shelf that has both. An alternative would be to simply adhere a set of hooks to an existing shelf. Utilize the surplus of storage space to store all your culinary necessities. For the utility hooks that come with the intention of doubling as a decorative detail in lieu of something entirely functional, bring together an eclectic array of decorative accents that complement one another. In this 70s-inspired beachy home, a modest yet intricately detailed hook mount comes decked with a trio of eye-catching elements that contribute to the aesthetic design of their surround.